A friend of mine made me aware of a book (or, rather, a couple of books) about the Boer War which I had not previously seen. 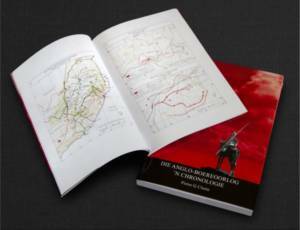 Catchily titled, ‘Die Anglo-Boereoorloog, ‘n Chronologie & Die Kaarte’, this claimed not only to be a full chronology of the conflict, but also a collection of maps and diagrams etc. At first, this sounded great, but a quick look into subject made it clear that this offering came with the full backing of some leading ‘Defenders of the Myth’, and I started to fear the worst. That’s why this updated and extensive Afrikaans follow-up of Pieter Cloete’s previous ‘The Anglo-Boer War: A chronology’ is so welcome to me. The compiler has made a great deal of effort to present the chronology as fully as possible – as close as possible, as information about those unrecorded skirmishes will still evade us. But look at his list of consulted sources and his endnotes, and you realize: This is a thorough work, an asset! The outstanding maps – Pieter Cloete is after all an architect – and statistics provide a further wonderful dimension to this work. Quite simply it should be on the shelf of every person with interest in the subject – and within easy reach. A ringing endorsement indeed… one would think. “The title of this book suggests a boring list of events. Quite to the contrary, it is a thorough, well-conceived and highly readable account. It is thorough. Primary sources were not used because that was not necessary for the author’s purpose of compiling a day-to-day record of the run-up to the war, the war itself and its aftermath. However, secondary sources were used to good effect to secure a really comprehensive report. The day-by-day detailed account of events could have resulted in a hopeless jumble. The author obviated this danger by his well-conceived strategy of grouping events under regional, campaign and other headings, so it is easy to follow a particular thread, while not losing sight of synchronous developments. The chronicle is enlivened by the use of the present tense; the inclusion of many portraits; the judicious use of quotations from a variety of sources and the inclusion of “trivia‟, designed to provide a wider perspective. Wow – impressive stuff! Something that even the ‘very critical’ Mr Boje can recommend… must be full of accurate, well researched data, then? Alas no – far from it. Apparently the Chronology itself is worth a read, but all it took was as quick glance at the maps and diagrams booklet for me to realise that this was actually a poorly researched piece of work – but, happily for the author, one which did not challenge the myths Pretorius and Boje are so frantic to perpetuate… hence the rave reviews. 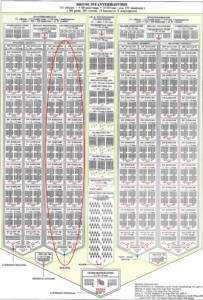 You will notice I have indicated part of this diagram with a red circle. This chap (fully supported by rave reviews from so-called ‘experts’, remember) claims that a British Brigade of the period was formed from two ‘regiments’ each of two battalions, with each such ‘regiment’ commanded by a Colonel. This is, quite simply, rubbish, and serves only to indicate a complete lack of understanding of the British army. A ‘regiment’ in British infantry terms was not (and is not) a tactical or operational unit – it was / is an administrative / recruitment construct. The ‘Colonel in Chief’ of a regiment is a purely symbolic / ceremonial appointment, and has nothing to do with operations – for example, HRH, the Prince of Wales is the Colonel in Chief of the Parachute Regiment today. A regiment of the period typically had two regular battalions, and one or two militia (reserve) battalions, but these did not fight together as ‘a regiment’ – typically one regular battalion was based in the UK, while the other was deployed to some part of the Empire. These would then switch out periodically. On operations, the manoeuvre elements of a British Infantry Brigade were (and still are) these battalions, not regiments – during the Boer War there were typically four battalions in a Brigade, though later (during the Great War) this was reduced to three. During the Great War, the American army used a system of Brigades made up of Regiments which were, in turn, made up of Battalions[i], but this was certainly not the British system. The battalions which were grouped together into a brigade could be from any regiment, though often battalions from ‘similar’ regiments were brigaded together: eg. battalions from various Fusilier regiments might be brigaded together in a ‘Fusilier Brigade’, those from various Highland regiments brigaded to form a ‘Highland Brigade’, or those from the Guards regiments brigaded into a ‘Guards Brigade’. 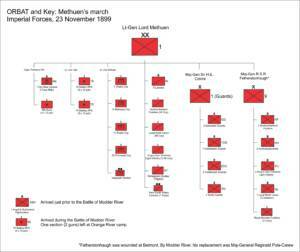 As shown (towards the right of the diagram), Lord Methuen had two infantry Brigades: the 1st (Guards) and the 9th Infantry. The Guards Brigade was made up of four battalions: the 3rd battalion, Grenadier Guards, the 1st and 2nd battalions, Coldstream Guards, and the 1st battalion, Scots Guards. The 9th Infantry was very slightly understrength, comprising the 1st battalion, Northumberland Fusiliers, the 2nd battalion, Northamptonshire Regiment, the 2nd battalion, King’s Own Yorkshire Light Infantry, half of the 1st battalion, Loyal North Lancashire Regiment, and two companies of the Royal Munster Fusiliers. The important thing to note is that his brigades were not each sub-divided into two ‘regiments’ – the battalion was the building block of the brigade, just as the company was the building block of the battalion. Fair enough – not a massive deal: a simple mistake by someone who doesn’t know much about the British army… but why, one wonders, did Prof Pretorius – a man who could barely control himself when he noticed a spelling mistake in my book – not spot it? And how did it get past Mr Boje – a man so passionate about this subject that he was happy to tell blatant lies about the sources used in a book he doesn’t like? The only logical deduction is that these two either had their reasons for turning a blind eye to this glaring historical inaccuracy, or they are equally ignorant about the British army of the period. No matter, I thought – it’s just one error and we are assured by these ‘experts’ that this is an amazing piece of scholarship… so the rest must be OK, right? Unfortunately, this is not the best scan ever, but basically this is his attempt to explain British army ranks. Alas, there are many mistakes in it, as, towards the bottom, he completely misses out the ranks between Sergeant and 2nd Lieutenant – quite why Colour Sergeants / Staff Sergeants and Warrant Officers did not get a mention is anyone’s guess. He also makes the mistake of using the very American term ‘1st Lieutenant’ which was / is not in British army usage – only certain branches had ever used this term, and the whole British army had switched to ‘Lieutenant’ in 1871. Further up the column, he repeats the bizarre mistake of claiming that a British army Colonel commanded ‘a regiment’ of 2000 men, and then, for reasons known only to himself, he skips from Lt. General to Field Marshal, without pausing to mention the rather important rank of ‘General’. So the long and the short of it is that this chart is so riddled with basic errors as to be of little use to man or beast – so why, one wonders, did the Pretorius / Boje combo fail to pounce up on it? Obviously enough, ‘Britse en Empire Regimente in SA 1899-1902’ translates to: ‘British and Imperial Regiments in South Africa, 1899-1902’… and ‘Aantal bataljonne’ means ‘Number of Battalions’… so this, one would be forgiven for thinking, shows the number of battalions of each regiment which fought in South Africa during the war. ‘Ten minste een batalijon van elkeen van heirdie regimente he in SA diens gedoen’, or ‘At least one battalion of each of these regiments served in South Africa’. 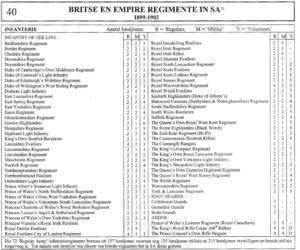 So while not strictly speaking ‘wrong’, this vast list is patently NOT in any way representative of the ‘British and Imperial Regiments in South Africa, 1899-1902’ at all – it is simply a complete list of all the battalions (Regular and Militia) of the regiments of the British army scattered all across the globe… with the various associated volunteer battalions thrown in for good measure, even though these were not even part of the army as such – they were not recorded in Hart’s Army Lists, for example, and instead were little more than gentlemen’s rifle associations, and only liable for home defence[ii]. So quite what makes this such an invaluable resource (a ‘highly recommend asset’, no less) is beyond me – it would be a little like including a table entitled: ‘German Army units in South Africa 1899-1902’, in which all the hundreds of German regiments of regulars and reservists were listed… and then including a little caveat at the bottom saying: ‘individual volunteers from some of these regiments fought for the Boers’. 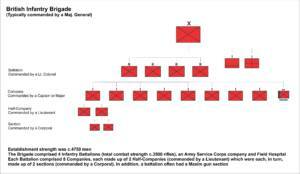 To demonstrate just how misleading this chart is, let’s take a couple of the regiments by way of example. The King’s Royal Rifle Corps (the old 60th Rifles) is somewhat eye-catching, due to the suggestion that it had 4 regular battalions[iii], 4 militia battalions and no less than 13 volunteer battalions ‘in South Africa 1899 – 1902’ (ahem). Of the four regular battalions of the KRRC (the 1st, 2nd, 3rd and 4th), the 1st battalion served in South Africa for the duration of the war, and the 3rd battalion was in theatre from November 1899 until the end of the war. The 2nd battalion, however, was only in theatre from October 1899 to July 1900, while the 4th only arrived at the very end (in January 1902). But fair enough – all four regular battalions of the KRRC deployed to South Africa at some point during the war. Of the four Militia battalions of the KRRC (the 5th, 7th, 8th and 9th), however, only the 9th was mobilised to the Boer War, shipping out in January 1900 and being home and disembodied again by July 1901[iv]. None of the Volunteer Battalions were deployed to South Africa – they were home defence units only. Obviously, individual officers and small contingents from both the other Militia and associated Volunteer units of the KKRC served with the regular battalions and the City Imperial Volunteers. But of the 21 battalions of the KRRC so gleefully (if implausibly) trumpeted on the chart, only five of these were mobilised to South Africa, and only two of these five for anything approaching the entirety of the conflict. So why not make this historical reality clear? So though the Essex Regiment might have been a whopping 8 battalions strong on paper (and on this somewhat misleading chart), only three served in South Africa – and only one of those for anything approaching the entirety of the conflict. Again – surely the chart would be of more use if it made this reality clear? Furthermore, infantry regiments in which both regular battalions served at some point in South Africa were relatively unusual. The Argyll & Sutherlands, the Bedfordshires, the Royal Berkshires, the Border Regiment, the Cameron Highlanders, the Cheshires, the Connaught Rangers, the Duke of Cornwall’s Light Infantry, the Derbyshires, the Dorsets, the Durham Light Infantry, the Hampshires, the Highland Light Infantry, the Royal Irish Regiment, the Royal Irish Rifles, the East Kents, the Royal West Kents, the Lancashire Fusiliers, the Royal Lancasters, the Loyal North Lancashires, the East Lancashires, the South Lancashires, the Leicesters, the Lincolns, the Liverpools, the Middlesex, the Norfolks, the Northamptons, the Oxfordshire Light Infantry, the Royal Fusiliers, the Royal Scots Fusiliers, the Royal Scots, the KOSBs, the Scottish Rifles, the Seaforth Highlanders, the Shropshire Light Infantry, the Somerset Light Infantry, the South Wales Borderers, the North Staffords, the South Staffords, the Suffolks, the East Surreys, the West Surreys, the Royal Sussex, the Royal Warwickshires, the Royal Welsh Fusiliers, the Welsh Regiment, the West Riding Regiment, the Wiltshires, the York and Lancasters, the Yorkshire Light Infantry, the Yorkshire Regiment, the East Yorks and the West Yorks[viii] all only deployed one regular battalion to the Boer War. 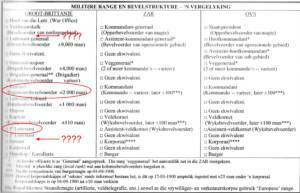 So if the purpose of this chart was to give an accurate impression of the units which the British army deployed to South Africa during the war, then it has certainly failed in this aim. Of course, if the purpose was actually to maintain the myth that the British army in South Africa was some enormously vast behemoth of a thing – and thus frantically attempt to explain away the Boer defeat – then the chart does its job admirably. We can all make mistakes, but more intriguing is why would such ‘esteemed’ reviewers overlook this error / attempt at confusion? Anyone would think it rather pleased them that this work subtly perpetuates the reassuring myth that it took countless millions of British troops to subdue the plucky old Boers – and to hell with historical reality. Given that the poor old Professor got his knickers in such a twist over the mis-spelling of ‘Colvile’ as ‘Colville’ in KK&K, it is noteworthy that he cheerfully overlooks the mis-spelling of ‘Cameronians’ as ‘Cameroneans’ on this chart and (worse) the way the ‘Loyal North Lancashire Regiment’ is reinvented as the ‘Royal North Lancashire Regiment’. [ix] But perhaps spelling mistakes only become heinously unforgivable when the one who makes them dares to challenge his much cherished (though increasingly laughable) myth? The lesson is simple: if you want to get a glowing review / foreword from this True Believing Twosome, you don’t have to worry about being historically accurate, or knowing much about the subject – all you need to do is write a book that doesn’t threaten their preferred fiction. [ii] First raised in 1859 after an invasion scare following the deterioration of relations with France, the volunteer units were formed by the Lord Lieutenants of the counties of England, Scotland and Wales. Joining the volunteers was considered rather more upmarket than the militia – volunteers had to pay for their own weapon and units were entitled to design their own uniform. This rather ad hoc set up had been formalised to an extent by the time of the Boer War, with the chaotic mix of small volunteer units having been lumped together into what were essentially home defence battalions. Though the battalions themselves could not be sent overseas, this body of enthusiastic, if barely-trained, men provided a useful pool of manpower to reinforce understrength regular units during the Boer War, and Volunteer Active Service Companies were formed for service in South Africa. As part of the Haldane Reforms prior to the Great War, the Volunteers were amalgamated with the Militia and the Yeomanry, together forming the Territorial Force, which in turn became the Territorial Army after the Great War. [vi] John Wm. Burrows, Essex Units in the War 1914–1919, Vol 5, Essex Territorial Infantry Brigade (4th, 5th, 6th and 7th Battalions), Also 8th (Cyclist) Battalion The Essex Regiment, Southend: John H. Burrows & Sons, 1932.